Nashville, TN – Tennessee Department of Education Commissioner Candice McQueen today released the results from the 2018 Tennessee Educator Survey, which was completed by nearly 40,000 Tennessee educators, representing 58 percent of the state’s teachers – an all-time high response rate. Survey results point to progress made and maintained in a number of areas, alongside several areas where our state’s educators continue to see a need for improvement. This is the eighth year that the department, in partnership with Vanderbilt University, has surveyed all educators in the state to gather feedback and include teachers’ voices in department strategy, policy decisions, and goal setting. The Tennessee Educator Survey, designed in conjunction with the Tennessee Education Research Alliance at Vanderbilt University (TERA), aims to measure and evaluate teacher perceptions, monitor school climates and culture across the state. Compared to 2017, 22 percent fewer teachers report feeling pulled in too many directions in terms of what to teach and how to teach it. This suggests that teachers are adjusting to the expectations set by new grade-level standards and are feeling more confident and better supported as they teach those. Since 2012, there has been a steady increase in the percentage of teachers reporting that the evaluation process has led to improvements in their teaching—going from one-third of teachers to about three-fourths over the last six years. 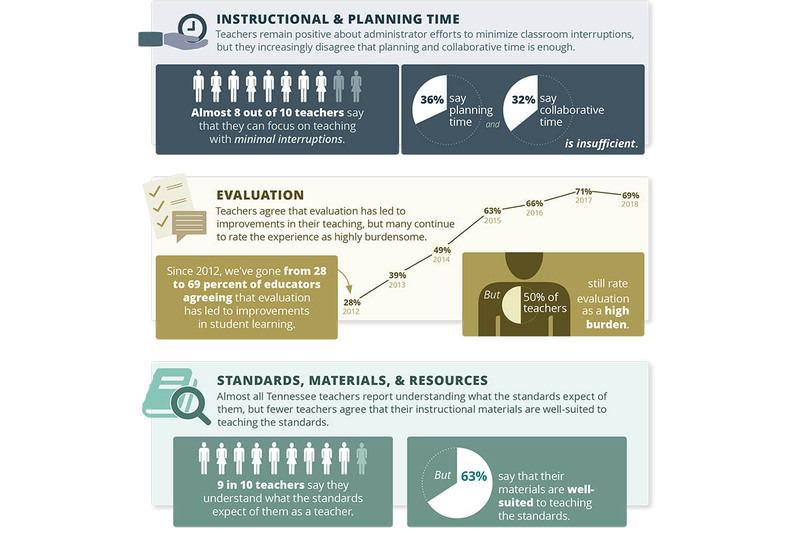 This year, 72 percent of educators say evaluation has led to improvements in their teaching. Educators also noted they desire higher quality feedback from observations, along with the time and space to work on areas of improvement. The department is using the feedback to identify areas to continue to improve, such as ensuring observation provides useful and timely feedback and reducing the time and resources burden that some educators report. Overall, 9 in 10 teachers report that they understand what the state academic standards expect of them as a teacher, but fewer, only 6 in 10, report feeling the materials currently available to them are well-suited for teaching the standards. 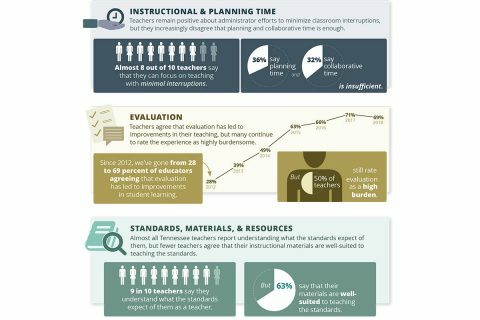 The survey finds that more teachers would benefit from improved access to strong instructional materials, along with receiving the training and support necessary to properly implement curriculum in their classroom. Earlier this year, the department started a new initiative – Ready with Resources – as an outgrowth of the Read to be Ready work. This will provide more teachers with access to optional high-quality instructional materials and support districts in planning for adoption of new resources. Three out of four teachers reported that they feel more empowered, versus constrained, to teach in ways that they feel are best for their students. Many teachers attributed their empowerment to having the autonomy to implement their curriculum to best meet their students’ needs, among other reasons. These findings continue to show that state, district, and school leaders must work together to support educators, which will align resources, create stability and consistency, and maximize teachers’ effectiveness in the classroom. [320left]The department shares school and district survey results directly with local leaders to inform their decision-making, and the department also uses the state-level information to guide the department’s work. Additionally, the department’s regional offices use the survey results to provide districts with the support to create regional collaborative relationships, differentiated professional development, and evidence-based best practice sharing. These insights and more can be seen on the 2018 survey website. The online portal allows users to view aggregate statewide teacher and administrator responses, as well as district- and school-specific information, provided they meet or exceed a minimum participation threshold of 45 percent. This year, 1,167 schools and 133 districts met the 45 percent threshold to receive school- and district-level data. To view the 2018 Tennessee Educator Survey results and read the report, Reflections over Time: Tennessee Educator Survey 2018 Results in Context, visit the department’s website here. For more information about the Tennessee Educator Survey, please contact Laura Booker, executive director of research, at Laura.Booker@tn.gov. For media inquiries, please contact Sara Gast at 615) 532-6260 or Sara.Gast@tn.gov. ©2008 Discover Paris TN, Paris TN Web Design and Hosting by Compu-Net Enterprises.